Biking to work is a popular activity in the densely populated city of Westwood. 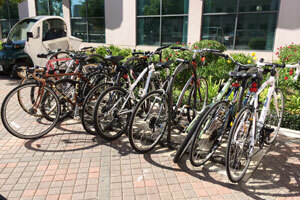 To promote this healthy and Earth friendly activity, there are several bike racks near the medical center and medical plazas. There are also repair stands and bike pumps located throughout the campus. The nearest stand to the medical center is located in 100 UCLA Medical Plaza, northwest side next to the Deli. UCLA Transportation offers great commuting alternatives to staff, faculty and students on the Westwood campus. Commuting options are available on the UCLA Transportation website. The Santa Monica Campus Rideshare Program is available for staff working at UCLA Medical Center, Santa Monica. To get on-board, contact our Photo ID and Parking Office at (424) 259-9109. UCLA Health offers a shuttle service for staff commuting between Ronald Reagan UCLA Medical Center, the Center for Health Sciences (CHS), Wilshire Center, and UCLA Medical Center, Santa Monica. Shuttle runs every 15 to 30 minutes. Click here to see the full schedule as of July 7, 2014. Wilshire Center on Ashton Ave. The city of Santa Monica has officially launched its new bike-sharing program called "Breeze," with the rollout of 500 bikes at 75 stations throughout the city and five additional stations in neighboring Venice. Our Santa Monica campus, which served as one of seven pilot sites for the program, now has a permanent Breeze station located outside our Arizona parking structure. Under the program, bike rentals are available on an hourly, monthly or yearly basis to get around Santa Monica. Bikes can be returned to another Breeze station or locked in a public place. GPS sensors on the bikes alert officials to their locations and Breeze personnel make periodic rounds to gather and return them to the stations. 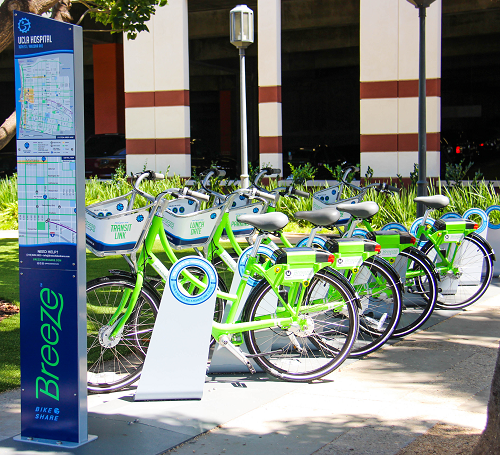 Although Breeze stations are currently limited to Santa Monica and nearby Venice, plans call for a regional system called "Westside Bikes," which will include stations in Westwood, enabling staff members to ride bikes between campuses. For more information about Breeze, visit santamonicabikeshare.com.